I downloaded timelapse images the other day from the restored stream/wetland at our Platte River Prairies. Among the long series of photos, there were a couple interesting short stories I thought I’d share. The first is something I’ve not seen before – a gang of great blue herons hanging out together. 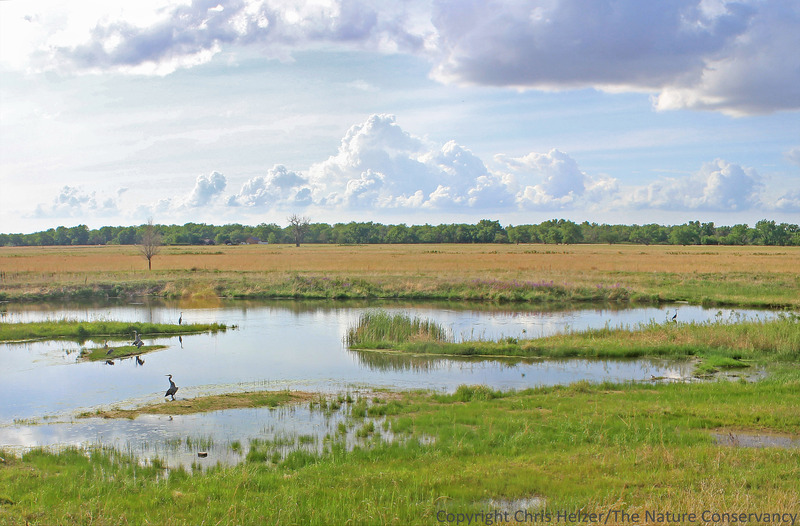 I’ve seen nesting colonies of herons before, but when I see them out on wetlands, it’s almost always a single bird – rarely two, but they’re usually spaced well apart and studiously ignoring each other. However, on May 25, a group of at least eight great blue herons spent a few hours feeding and lounging around together on our wetland. They were there for the 3pm, 4pm, and 5pm photos but not before or after. It’s certainly a relaxed-looking party – one of the birds was even laying down on its belly on the small island. Have any of you seen anything like this before? There are at least eight herons in this photo. Maybe nine – I can’t tell if the closest one is a single bird or two of them. 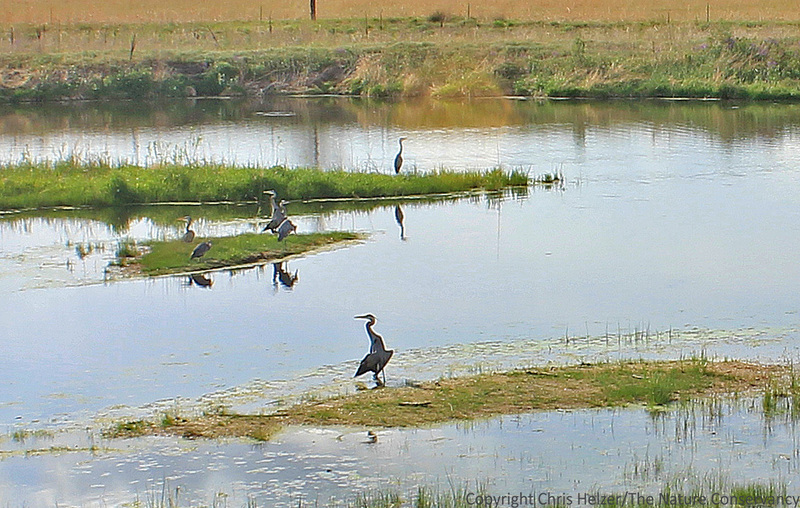 Here’s a more-cropped version of the same photo showing the main group of herons. What do you think? One bird or two in the foreground? …And here you can see the bird laying down on the island too. The second occurrence of note included an immature bald eagle feeding on something dead, surrounded by a group of turkey vultures. I can’t tell what’s being eaten, and of course we don’t know what happened prior to or after the photo. It’s possible the turkey vultures spotted the eagle feeding and figured they’d hang around for leftovers. However, I would guess the vultures were there first and the eagle bullied its way into the meal. Regardless, it was a fun surprise to find this image! As always, thanks to Moonshell Media for working with us on this timelapse project. 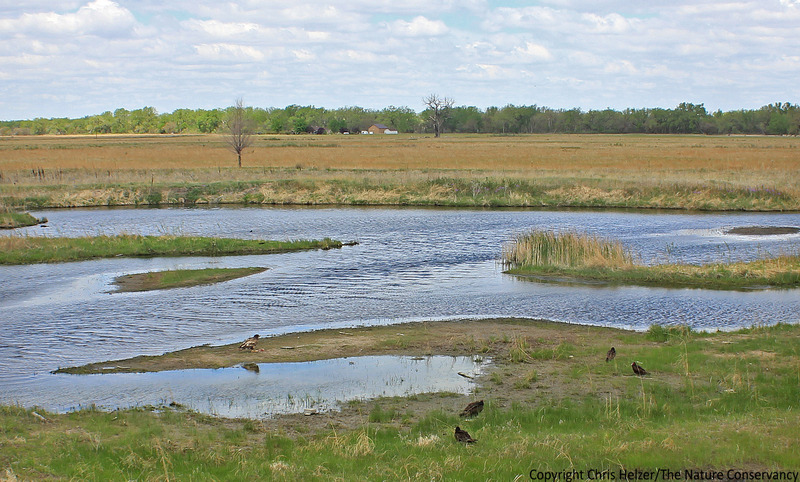 This entry was posted in Prairie Animals, Prairie Natural History, Prairie Photography and tagged derr wetland, eagle, heron, photography, platte river prairies, timelapse, vulture, wetland by Chris Helzer. Bookmark the permalink. With regard to the group of great blue herons, I’ve only seen them in groups similar to this where there was an unusual abundance of food, specifically along the jetties at Port Aransas. Otherwise they are pretty much solitaries. It is so nice that you are out there in the blazing heat taking these great photos so I can stay inside and wish that the a/c would keep up. I have never seen Herons like this! And I’ve rarely seen my favorite bird, the Turkey Vulture, grouped up to eat. But I did see Black Vultures on a boar in Georgia. They are very sociable. It appears the foreground heron has it wings out sunning himself. I see turkey vultures doing the same usually first thing in the morning. Is this the same Mitch Coffin from whom I got Nebraska Weeds? If so, great to see that you follow Chris’ blog. Yes Steve, still fighting weeds. “Nebraska Weeds”? Is that the title? Where can I find it? The title is now, Weeds of the Great Plains. You can order by credit card by calling 402-471-2351. They are $25.00 which includes shipping and handling in the U.S.